US university libraries are unloading millions of unread volumes in a nationwide purge that has some print-loving scholars deeply unsettled. A library without books? Not quite, but as students abandon the stacks in favor of online reference material, university libraries are unloading millions of unread volumes in a nationwide purge that has some print-loving scholars deeply unsettled. Libraries are putting books in storage, contracting with resellers or recycling them. An increasing number of books exist in the cloud, and libraries are banding together to ensure print copies are retained by someone, somewhere. Still, that doesn’t always sit well with academics who practically live in the library and argue that large, readily available print collections are vital to research. At Indiana University of Pennsylvania, the library shelves overflow with books that get little attention. A dusty monograph on “Economic Development in Victorian Scotland.” International Television Almanacs from 1978, 1985 and 1986. A book whose title “Personal Finance” sounds relevant until you see the publication date: 1961. Dierra Rowland, 19, of Philadelphia, studies at the Indiana University of Pennsylvania library. The shelf of books marked with red stickers could be removed as part of IUP’s plan to remove tens of thousands of books. Though “weeding” has always taken place at libraries, experts say the pace is picking up. Finances are one factor. Between staffing, utility costs and other expenses, it costs an estimated US$4 to keep a book on the shelf for a year, according to a 2009 study. Space is another; libraries are simply running out of room. And, of course, the digitization of books and other printed materials has dramatically affected the way students do research. Circulation has been going down for years. 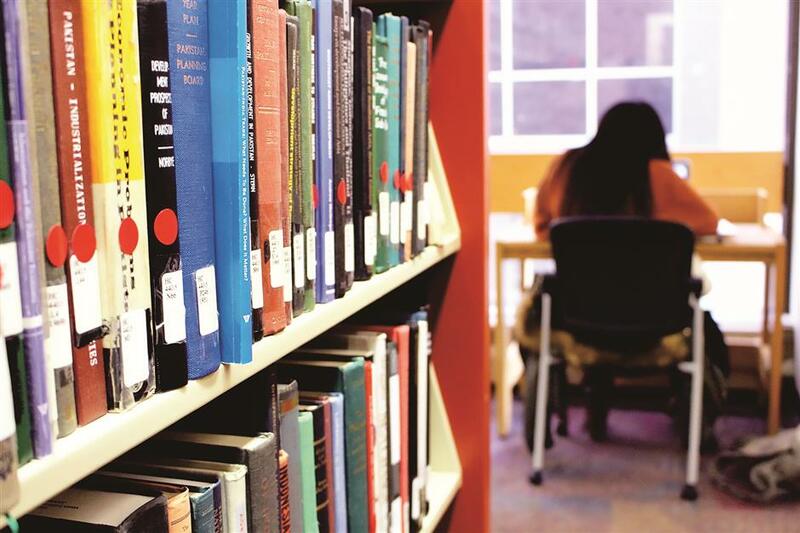 Libraries say they need to evolve and make better use of precious campus real estate. Students still flock to the library; they’re just using it in different ways. Bookshelves are making way for group study rooms and tutoring centers, “makerspaces” and coffee shops, as libraries reinvent themselves in the digital age. Until recently, a library’s value was measured by the size and scope of its holdings. Some academics still see it that way. At Syracuse University, hundreds of faculty and students objected to a plan to ship books to a warehouse four hours away. The school wound up building its own storage facility for 1.2 million books near campus. At IUP, a state university 96 kilometers from Pittsburgh, faculty reacted with alarm after school officials announced a plan to discard up to a third of its books. Cashdollar argued that circulation is a poor indicator of a book’s value, since books are often consulted but not checked out. Substantially thinning a library’s print collection also ignores the role of serendipity in research‚ looking for one book in the stacks and stumbling upon another, leading to some new insight or approach, Cashdollar and other critics say. Libraries say the goal is to make their own collections more relevant to students while also making sure weeded materials aren’t lost to history. A large digital repository called HathiTrust has commitments from 50 member libraries to retain more than 16 million printed volumes. Another 6 million have been preserved by the Eastern Academic Scholars’ Trust, a consortium of 60 libraries from Maine to Florida. An IUP faculty committee is reviewing what Moerland dryly calls the “hit list” to make sure important works stay on the shelves. The final number of books to be removed has yet to be determined, but the potential scale is readily apparent. Librarians have affixed large red stickers to the spines of hit-listed volumes.